Wondering who runs the world? Just ask Beyonce — yes, girls. As true as that is in human society (and we know we can do better), it is even more true in elephant society. In the elephant world, every day is #DayoftheGirl — at least in terms of the structure of elephant families. Food Finders: “Elephant families revolve around females,” observes Vicki Fishlock, the Resident Scientist at the Amboseli Elephant Research Project (AERP, a Moving Giants “Elephant Champion”), which has closely studied elephant societies in the wild). “Males leave at puberty and become socially independent, but females remain within their families for their whole lives. They rear their calves alongside their mothers, grandmothers, sisters and aunts." 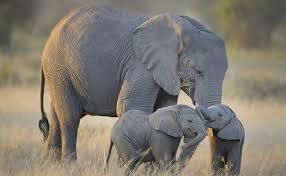 Pachyderm Pollsters: Elephant societies might be more democratic than, ahem, certain human ones. Elephant Voices (another Moving Giants “Elephant Champion”) reports that "Successful matriarchs are not self-appointed leaders of their family; they are leaders because members of their family respect them, and they are respected because they have proven over the years that they can be trusted to make wise decisions in a time of crisis. Through the years older females become ‘repositories’ of social and ecological knowledge. So natural leadership qualities (personality) and long experience combined are the makings of a wise matriarch. Individuals living in families with older, more experienced matriarchs seem to gain more (in terms of survivorship) from her experience." Respect Your Elders: Yes, today is International Day of the Girl, but it is also important to respect your mamas. A study by The Royal Society (a fellowship of "many of the world's most eminent scientists" and "the oldest scientific academy in continuous existence") found that older female elephant matriarchs had more responsible reactions to protecting their families from lion threats than younger matriarchs.